Prescott, celebrating its 125th World’s Oldest Rodeo and the state of Arizona’s Centennial, hosted a major parade this morning. We arrived about 9 a.m. and stayed until almost 11 a.m., finding a shady spot along Montezuma Street just beyond Whiskey Row. 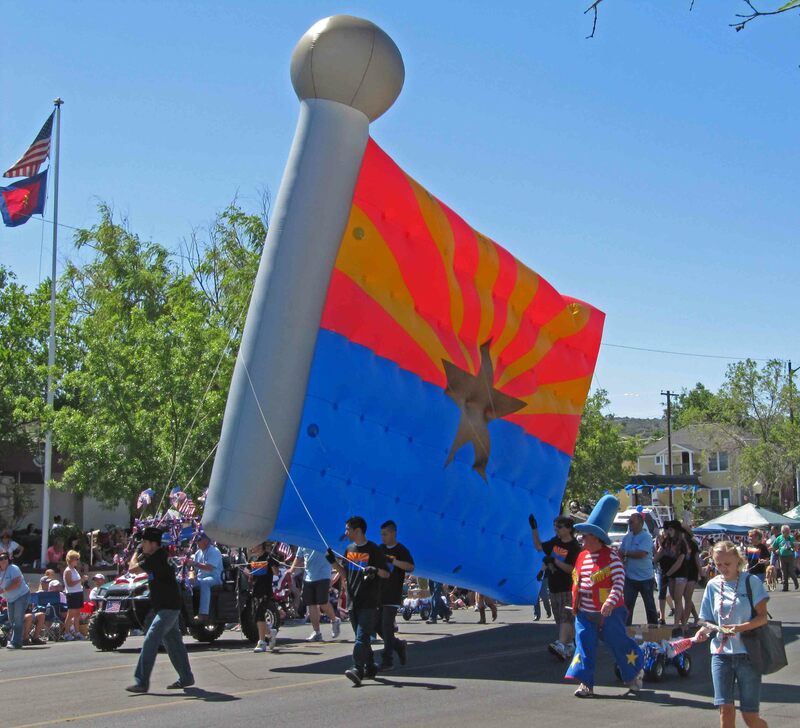 The theme for this year’s parade was “Prescott — Where It All Began.” Arizona Public Service displayed a huge inflatable state flag. The parade was organized by time segments with the first representing pre-1912, the year of Arizona’s statehood, and then by 25 year periods. There were lots of horses, some pulling wagons, others with cowboy/cowgirl riders. Period costumes appeared authentic although most had to be hot with temperatures rising into the 90s. Horse pooper scoopers chose different themes for their work such as wearing over-sized cowboy hats, wearing surgical masks or baseball outfits, and using a miniature train engine with car for collecting equestrian deposits. Antique fire engines, cars, and tractors added to creative floats. A couple of different bagpipe groups provided music. Of course, politicians were also well represented. Dentist and Representative Paul Gosar distributed practical toothbrushes. We appreciated the Lions and 4-H youth selling cold water. Somewhat surprisingly, Prescott’s parade was much better than Chicago’s St. Patrick’s Day parade. The 31st annual Prescott Bluegrass Festival moved from the north side of the Yavapai County Courthouse to the south side. The stage area sat on Goodwin Street which provided for more lawn chair seating and with additional speakers some distance from the stage better sound. We listened to two groups on Sunday that had also played on Saturday. Virtual Strangers from San Diego featured Mike Tatar on guitar, his wife Yvonne Tatar on stand up bass, Jon Cherry on mandolin, and Kit Birkett on guitar. 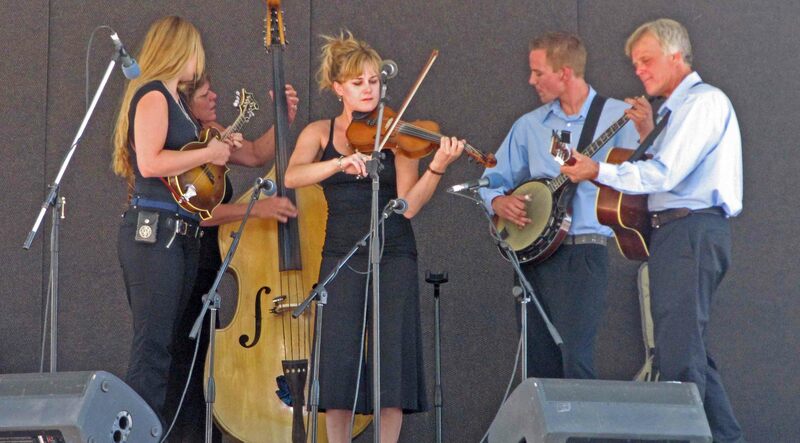 Burnett Family Bluegrass from Flagstaff featured Brian on guitar, his wife Connie on acoustic bass, Rachel on fiddle including a special five-string fiddle, Jessie on mandolin and fiddle, and Ryan on banjo and fiddle. This annual festival brings remarkable talent to Prescott. 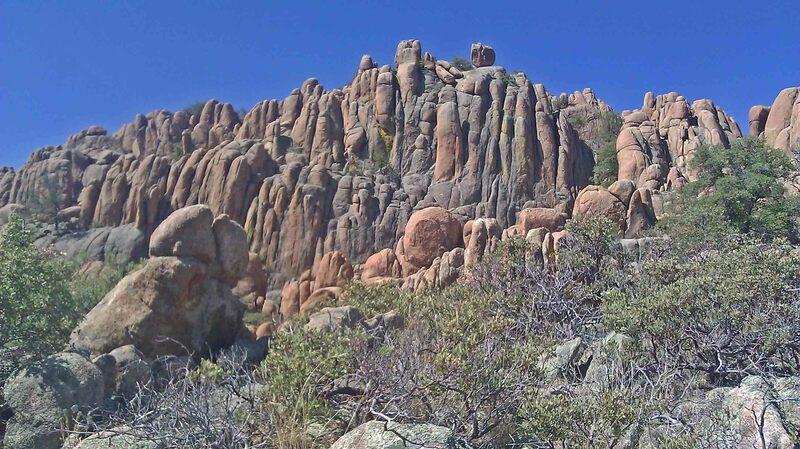 Last fall we attempted to hike the Mint Wash Loop as part of Prescott’s Take a Hike program. We hiked the first leg on Trail #347 but then proceeded on the Mint Wash Trail #345 toward Granite Lake rather than following it along the northeastern edge of the Granite Mountain Wilderness area. This time the expansive fields along the first leg were covered with a tall thistle gone to seed. After making the correct turn we enjoyed the scenic views of Granite Mountain. This second leg featured some Parry’s agave now in seed and a low lying dandelion-like flower with its seeds ready to blow in the wind. The final leg on Trail #308 returned us to the trailhead. 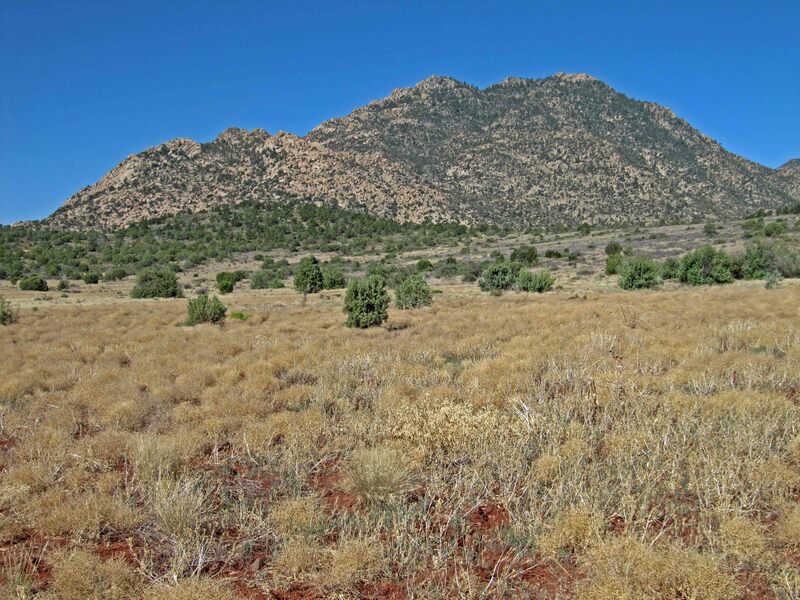 On a future hike we can discover where Trail #308 leads around and through the Granite Mountain Wilderness area. The final leg included several wildflowers such as the purple colored poisonous silverleaf nightshade, the daisy-like purple flower with yellow center of the fall tansyaster, the blue slimflower scurfpea, the yellow rough menodora, the white blooms of bluestem pricklepoppy, and a lower lying thistle still in bloom. We hiked in the morning on this hot summer day traversing elevations from 5,200 feet to 5,400 feet. Last fall we paid a price for hiking on a drizzly afternoon by finishing with mud caked tennis shoes. This is a popular starting point for horseback riding. Five vehicles that had transported horses were parked at the trailhead. A rider on a beautiful palomino horse named “Blue Eyes” passed us on our final leg. A couple on mountain bikes with a dog passed us on the first leg, took a different route than we did, but passed us again right before we returned to the trailhead. Another couple were allotting water to a half-dozen dogs in the shade about a quarter mile from the trailhead. This hike is a pleasant 3.4 miles best taken in the spring or fall when it hasn’t recently rained. Today we parked at the Centennial Trailhead on Kile Street and hiked east from the trail junction where we had turned around Monday. Small patches of toadflax penstemoan and wholeleaf Indian paintbrush daintily dotted the side of the trail to the junction. Views of Granite Mountain to the north graced us at the beginning of the hike. As we continued heading west, Thumb Butte came into view to the left of a home sitting atop a closer rise. Beardstongue sporadically showed up along our hike up what a developer calls Enchanted Canyon until we found ourselves parallel with the home which seemed so high only a short while before. The trail then weaved its way through boulders and ended at a road with two recently built homes opposite. 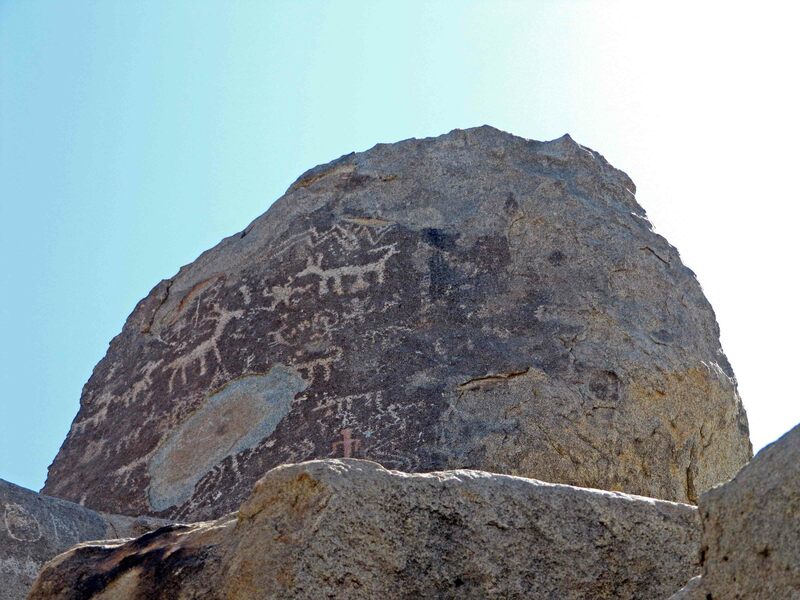 High standing granite boulders near the end of the trail offer striking petroglyphs, evidence of earlier inhabitants. 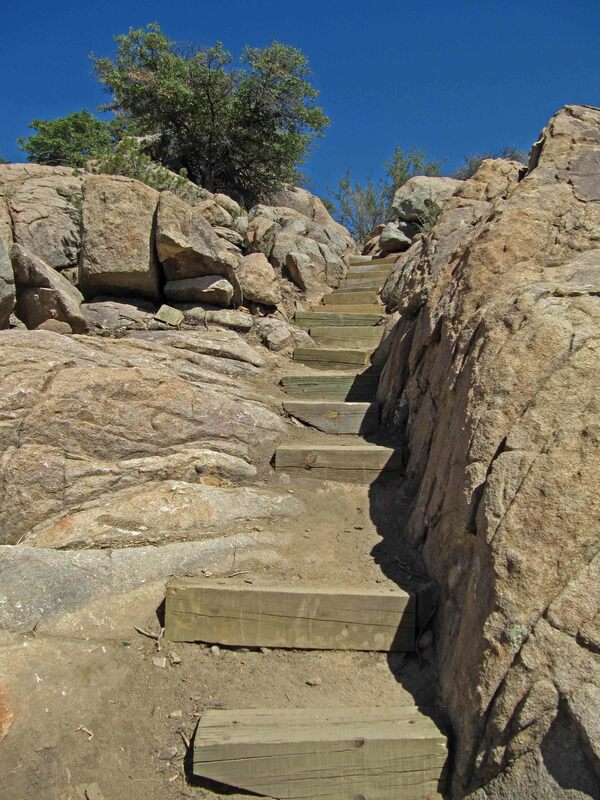 The Centennial Trail offers another interesting opportunity to explore Prescott. In honor of Arizona’s 100 years as a state, Prescott named its newest trail the Centennial Trail. We hiked from Westridge Drive to the junction with the designated parking area on Kile Street which is about one-half of this in-town trail. Near the beginning of the trail there is a steep climb on a nicely constructed staircase and we crossed two bridges. The elevation ranges from 5,447 feet to 5,729 feet. Good views of the rodeo grounds and downtown areas were visible on the first part of the trail and Granite Mountain later. We spotted red tubular flowers of beardstongue as we traversed through the boulders and chaparral canyons. We are appreciative of the 30 acres sold by The Preserve which made this trail possible. The Constellation Trails explore a section of the Granite Dells on the west side of State Route 89 just south of the Phippen Museum near Prescott, Arizona. The name comes from a training flight crash on February 28, 1959 of a U. S. Air Force Lockheed C-121G Super Constellation. During 2011 eagle scout Cody J. Walker worked to commemorate the deaths of five U. S. Navy crew members with the establishment of a bench, plaque, and remains from the crash. We hiked the outside trails, including the North 40 Trail, the Lost Wall Trail, and the Rock Wall Trail. The lowest elevation is 5.016 feet and the highest point is %,229 feet. A few wildflowers were in bloom such as bluestem pricklepoppy, bull thistle, and beargrass. We enjoyed the beautiful rock formations, especially from the Lost Wall Trail. We are appreciative of the Open Space Alliance which purchased the land which made these trails available.